I've sat across from someone I didn't know and when we left the restaurant 3 hours later, they felt like a friend. The Dinner Devils is a unique concept in Vancouver. These questions and answers will give you a good idea of what we’re about, what to expect and what is expected of you. If you have a question that isn’t answered here, feel free to send us a message. What is your RSVP policy? The RSVP list closes at 12pm the day before the dinner (so noon on Friday for a Saturday night dinner). If you are on the “going” list when the list closes, you will be expected at the dinner. Of course, if an emergency arises, we will understand. However double booking isn’t considered an emergency. If I have to cancel after the RSVP cut-off, how do I do it? 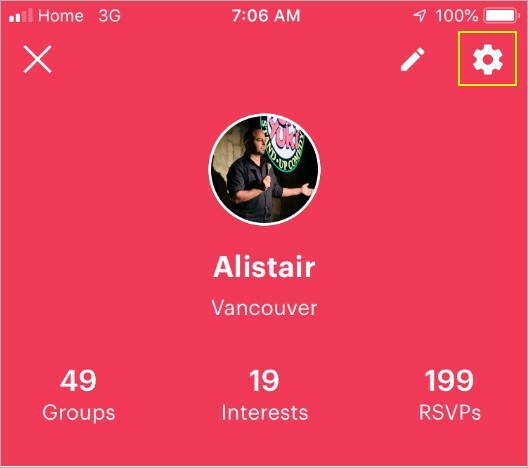 Please message Alistair through MeetUp Messenger to let him know why you are unable to attend. To message him click on his name (he is listed as the host on most dinners). When you go to his profile you will see the option “Message” which takes you to MeetUp Messenger. If I can't make it, when do I have to cancel by? You must remove yourself from the list by 12pm the day before the dinner (so noon on Friday for a Saturday night dinner). If you are on the waitlist and you cannot attend, you also need to remove yourself from it as last-minute cancellations can result in you being added to the “going” list. Is there a point going on the wait list? Absolutely! In the days leading up to a dinner, members firm up their plans and frequently a few will drop off. This frees up space for people to move across from the wait list. In addition, a couple of spaces are always held back for new members to be moved over, but you need to be on the wait list to be considered. The dinners fill up quickly, how do I get on? Ensure your notifications are turned on to ensure you receive either emails or app notifications when new dinners are posted on MeetUp. For instructions on how to do this, see the Technical section of this FAQ page. Also join our Facebook group as all new dinners are posted there as well. The best way to increase your likelihood of getting onto a dinner is to join the wait list. It’s not uncommon for members to drop off in the days leading up to a dinner, freeing up space for people on the wait list. Why is the Dinner Devils run through MeetUp? MeetUp is an established group of like-minded people who want to meet and enjoy the city. It was at a brunch MeetUp that the idea for this group came about, with people who met through MeetUp. They already have the infrastructure in place so no need to reinvent the wheel. It is a misconception to think MeetUp is only for people who are new to the city. Many long-time Vancouverites are on the site as it’s one of the most accessible ways to meet new people. How do you allocate who sits at each table? If there's someone I want to sit with, or avoid, can I request this? Yes, however there are no guarantees we will be able to honour it. Do members ever get removed from the group? For more information please see the code of conduct question below. What is the Dinner Devils' code of conduct? Be polite and friendly to the members of the group as well as to the staff at the restaurants. Be open to conversing with all members, regardless if you have met them before or not. Respect the RSVP policy (details can be found in the Membership section of this FAQ page). Respect people’s boundaries which can come in many forms. There aren’t any rules about topics of conversation, but be mindful you aren’t being offensive or making anyone feel uncomfortable. Yes, it’s $10 per year and is due at your second dinner with us. There are a number of costs associated with running this group. It is hosted on the MeetUp.com website which charges $90 every six months. In addition, there is the cost of running this website (domains, hosting, etc). 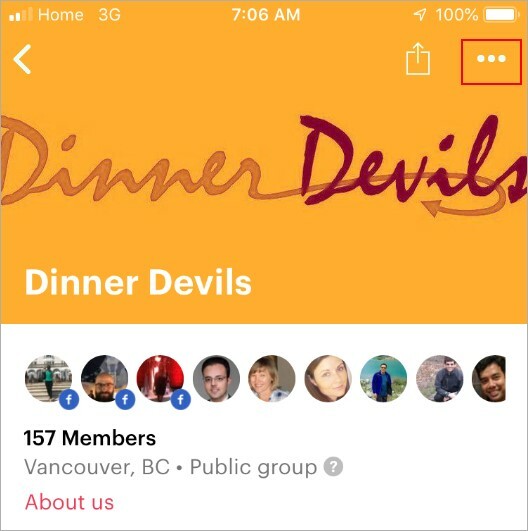 No one affiliated with the Dinner Devils profits from running this group. Is this a good group for singles? Yes, BUT, this is not a dating group. The majority of members are single. However anyone who uses this group as a way to meet people to date will be removed. Now that being said, real friendships have been made here and we promote the idea of people bonding and becoming friends outside of the group. If a relationship naturally forms in this way, that would be great. Is this a dating group? No, 100% not. Anyone using it as such will be removed. How do you pick the restaurants? Do you go to all types of restaurants? As far as types of food, yes, we go to all restaurants. We tend to mostly go to restaurants in Vancouver, however we have ventured across to North Van a few times as well as Burnaby. The key is that they are easily accessible on public transit (specifically Skytrain or Seabus). And we only go to restaurants that accept reservations. How many people do you take on each reservation? We like to limit the number of people at 6-8 per table. Because of this, we frequently make two reservations at the restaurants to allow us to accommodate more people. Some restaurants are smaller and that limits the number of people we can take. But if it’s a popular restaurant or a fantastic experience, we will go back again. Do you ever go back to the same restaurant twice? Absolutely! When we find a winner we are happy to return. In 2018 (the first year of the Dinner Devils) we visited the top 14 restaurants twice. How do we determine the top restaurants? Based on the feedback of the members that attended. How can I recommend a restaurant? We love to receive recommendations from our members. Please send them to us using this form. The question below about turning on your email notifications is there twice; with instructions for doing it on your laptop/desktop computer or on your cell. You only have to make the change in one location for it to work in both. 2. Hover over your image in the top right corner and on the dropdown menu, click Settings. 3. On the Settings screen, click Email Updates (second from the top). 4. IF you see the screen below, click the red Turn on button. If you do not see this screen, proceed to the next step. 5. The Email Notifications settings are split into two sections; Updates about you and Updates about your groups. In the Updates about you section, uncheck the boxes for the types of messages you DO NOT want to receive. 6. Still in the Email Notifications settings, scroll down to Updates about your groups and click Edit next to Dinner Devils. 7. Check the box next to New Meetup scheduled, as well as any other notifications you want to receive from the group. All the settings save automatically, so once you have done this you can navigate away from the site or close your internet browser. You should now start to receive emails when new dinners are posted. On desktop devices, this is all managed in one place. If changing your settings on your cell phone, you have to first turn on your general notifcations and then go into each specific group to manage which ones you receive communications from. 2. Click your photo in the top right corner. 6. 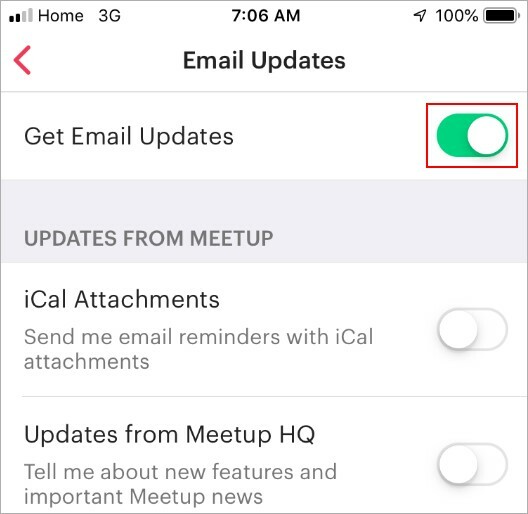 Ensure the toggle next to “Get Email Updates” is in the active position. 7. Now click the red back arrow in the top left, to return to the previous screen. 8. Click the red Done button in the top left of the screen. 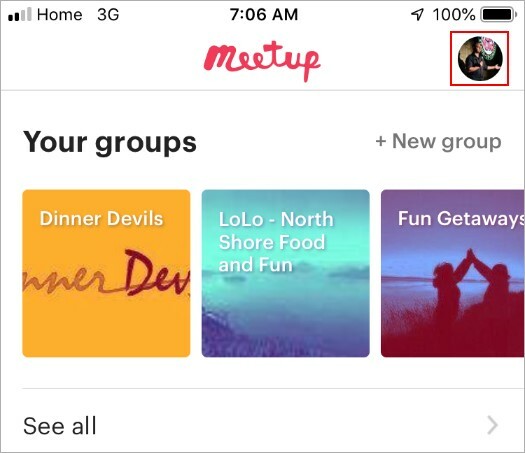 You should be back on your profile page, with your list of MeetUp groups displayed below your photo. 9. Scroll down and click on the Dinner Devils. 10. Click the three dots in the top right corner of the screen (depending on your device you might see a cog here). 11. Click Change email updates. 12. Ensure the toggle next to “New Meetup scheduled” is in the active position. 13. Click the red Done button in the top left of the screen. 14. You can now leave your settings screen and you should receive email alerts every time a new Dinner Devils dinner is organized. Are you ready to become a Devil?